On the way north, I also stopped at Norwich University—an old military college—in Northfield, where I located campus station WNUB-FM (88.3) but could not find a way to take an adequate photo of it. Perhaps next time I'll be able to walk right up to it, now that I know where it is. 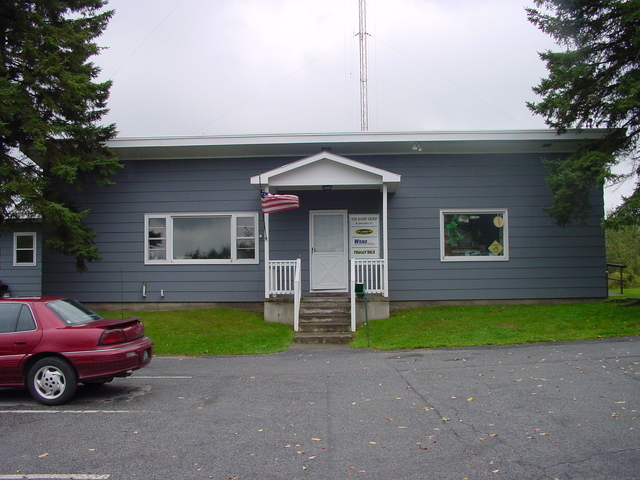 After leaving Northfield, I continued up I-89 to Barre (for you flatlanders, that rhymes with “Harry”) where the three-station Vox central Vermont group has its studios at 41 Jacques St. I would be astonished if this building were not the home of AM graveyarder WSNO (1450) since the day it signed on—and you can see the tower out back in the next photo. Hot AC WORK (107.1) began life as WSNO's FM sister in the one-to-a-market days, and under Vox ownership has been joined by Country “Froggy” WWFY (100.9 Berlin), a move-out from Middlebury (where it was a class-A as WGTK) put together by John Bulmer.